We offer birch plywood from Russia, Estonia and Finland, which is known for its warm light color, excellent strength, durability and affordable cost. 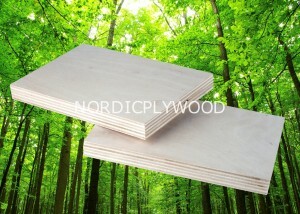 The surface of the birch plywood is nearly free of gaps and other defects which gives it impact resistance, smooth surface, great screw holding power and can therefore be used for building, construction, vehicle industry and other industries where special strength of a material is required. Due to not having almost any defects birch plywood has an attractive side profile, which makes it highly decorative and can therefore be used to build furniture. Grain may run in either direction on the face of the sheet. Since being a high-quality product almost without any defects birch plywood is an excellent material for furniture. Furniture builders even design their projects so that birch plywood’s beautiful layers would be seen as a decorative feature of natural wood. Birch plywood is also used in construction. Other areas of usage can be building cabinets, book cases, table tops, drawer sides and bottoms, skateboards, bed desks, toys, packaging, floors for sport arenas etc.